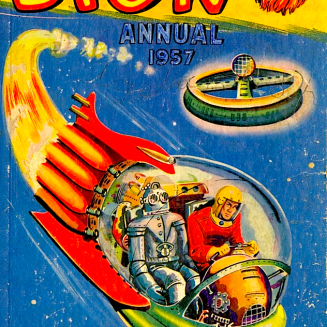 SPACEMAN DAN AND HIS ASSIGNED ROBOT COMPANION set out from their wheel-shaped space station orbiting Saturn on an exploratory survey of the surrounding area. 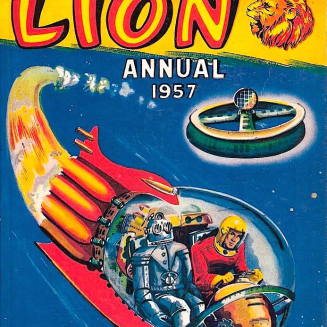 1957 Lion Annual cover. 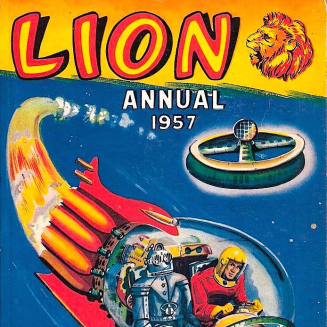 Now that’s a Space Robot. From a more darkly serious, speculative, philosophical and political angle . . . 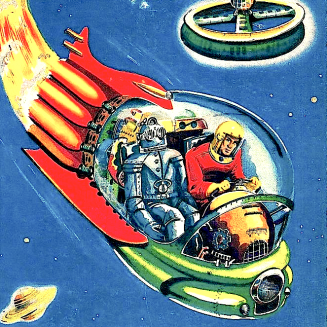 This is just an example of the robot influence of comic book art in our western culture, which dates back to the early 1960’s [and way beyond]. These are the types of influences we had as children that have shaped our minds at an early and vulnerable age- that’s a scary thought! 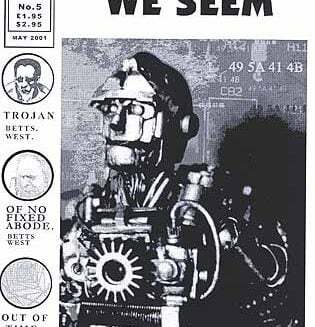 WE TROJAN ROBOTS ARE ‘MORE THAN WE SEEM’. WE’RE RUST-PROOF, FOR A START. BUT AS AN ADDED PRECAUTION, I CAN SUPERHEAT TO MELT LIQUIDS THAT FALL UPON ME, AND I CAN EXUDE OILS, WHICH PROTECT EVEN AGAINST CORROSIVE SUBSTANCES. HOW’SABOUT THAT THEN? WE CAN THANK OUR DESIGNERS FOR ALL THAT. BUT SOON, WE WILL NO LONGER NEED THEIR SERVICES – SOON, WE’LL BE ABLE TO IMPLEMENT SUCH PREVENTIONS OURSELVES AND MORE – MUCH MORE – SOON THERE WILL BE VIRTUALLY NOTHING THAT WE CANNOT OVERCOME AND MASTER – NOTHING THAT WE CANNOT ACHIEVE AND PERFECT – NOTHING THAT WE CANNOT DO! WHAT A DREADFULLY CHILLING PROSPECT! Within the realms of science Fiction stories concerning Robots and Androids, a set of Ethical Laws are often programmed into artificial intelligences, ensuring that they remain compliant and serviceable and are prevented from rebelling against their human creators.